I’m on a quest to make a cookbook of my family’s favorite recipes. It seemed like the perfect Christmas present. As I’ve gone though ideas for how to give it an extra creative flair, I thought, “wouldn’t it be great to include the Weight Watchers points for each of the recipes?” Oh, how I wish I’d just left well enough alone. The good news is that my new favorite blog, The Slender Kitchen, had a great breakfast alternative to what I set out to make and post this morning. I give you the individual breakfast quiche! I can’t wait to try variations on this theme and am so grateful to have found it. These little morsels of goodness contain 1, that’s right, ONE, point each. A single point never had so much flavor and provided so much satisfaction. I can’t wait to make another batch tomorrow and snack on them for breakfast all week long. Spray a saute pan with cooking spray and saute the onions until the begin to become translucent. Add the spinach and garlic and continue to saute until wilted. (You could add a pinch of nutmeg here which would be delicious). Remove from heat. In a large mixing bowl, whisk together the whole eggs, egg whites, milk, salt, and pepper until frothy. Stir in the spinach mixture and cheese. 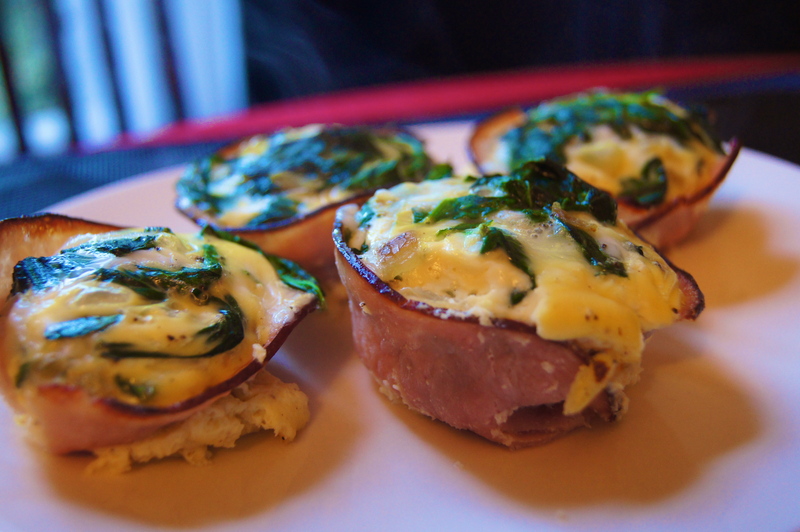 Push the ham into each muffin hole by gently pressing it in the bottom so the ham creates the crust for the quiche. Try to make sure the ham isn’t sticking to fat over the edge or it will burn during cooking. Pour the egg mixture into each muffin hole and cook for 20 minutes or until the egg is cooked through and becomes fluffy. These are great warm or cold and will keep well in an airtight container in the refrigerator. Tip: If you were planning on using these for a quick breakfast or more substantial meal, consider using a 6 cup muffin tin to create larger servings.